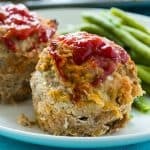 Cheesy Turkey Meatloaf Muffins are wonderfully moist and flavorful. Their mini size makes them perfect when you are tracking calories. The 2 things that can go really wrong with meatloaf are it can turn out dry and bland. 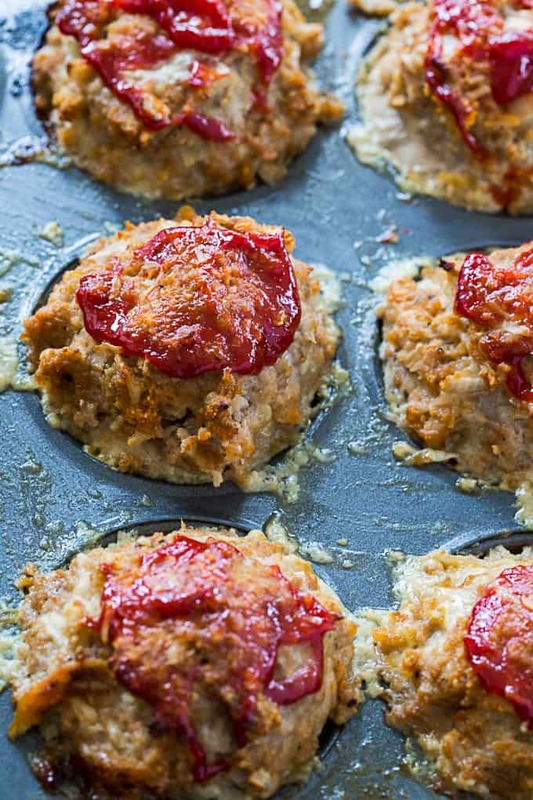 These Cheesy Turkey Meatloaf Muffins are neither. They have plenty of flavor from onion, garlic, cheese, Worcestershire sauce, poultry seasoning, and Italian seasoning. I especially like the flavor poultry seasoning adds. Ketchup and milk add plenty of moisture. The other great thing about meatloaf muffins is they cook up in a fraction of the time that meatloaf does. You can even make the meatloaf mixture a day in advance and then have a super quick and easy dinner. 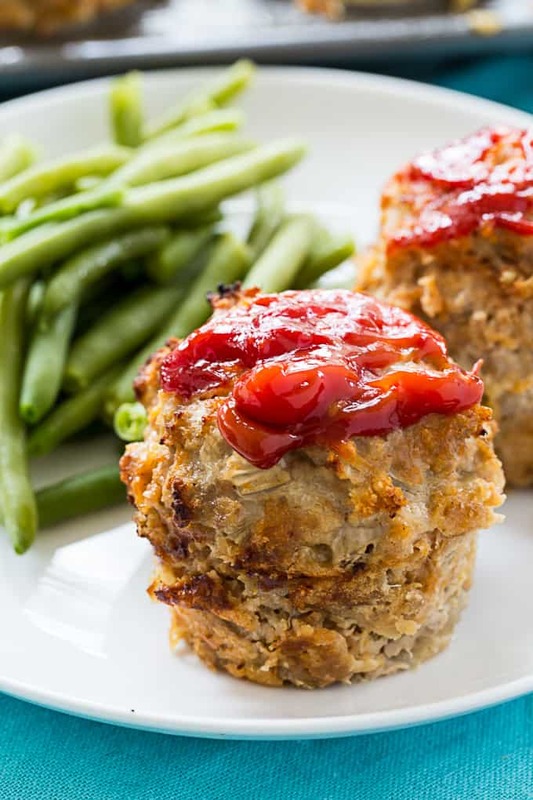 Making meatloaf in muffin tins is a great way to ensure you get the proper portion size. You can use either regular ground turkey or ground turkey breast which is lower in fat. To avoid tough meatloaf, do not overmix. You can try different cheeses. Parmesan, mozzarella and cheddar cheese all work well. These Cheesy Turkey Meatloaf Muffins are fairly low carb already. To make them truly low carb, use crushed Pork Rinds isntead of Panko crumbs. Preheat oven to 350 degrees. Spray 8 standard muffin cups with cooking spray. In a large bowl, combine ground turkey, 1/2 cup ketchup, onion, cheese, Panko crumbs, milk, egg, Worcestershire sauce, garlic, poultry seasoning, Italian seasoning, salt and pepper. Mix well. Divide mixture evenly between the 8 cups, mounding the mixture on top. Brush with remaining 1/4 cup ketchup. 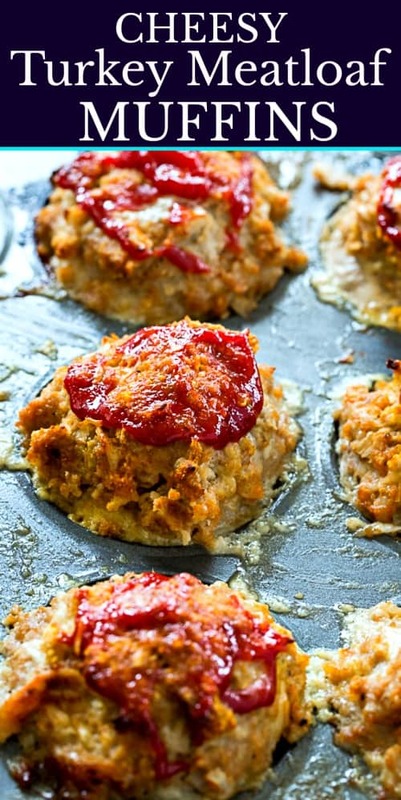 Place muffin tin on a cooking sheet to catch any juices that overflow. Bake for 30 to 35 minutes or until instant read thermometer inserted in center registers 170 degrees.